Set Time to 12:05 with the time set wheel in the back of the clock moving the hands clockwise. 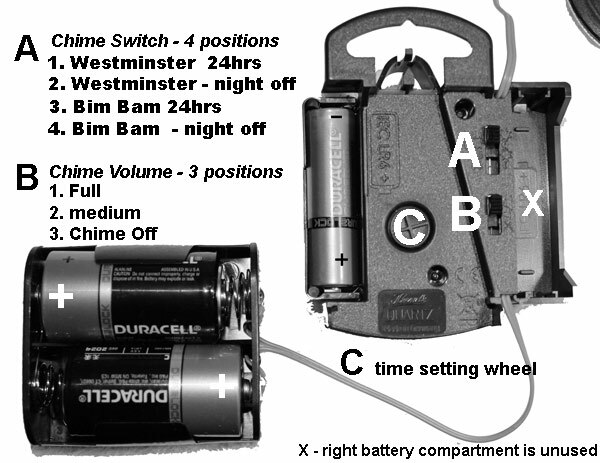 Insert 2 new Duracell “C” Batteries and 1 “AA” (1,5 V) Alkaline battery according to the correct polarity +/- symbols. No battery is needed for the right hand cavity. Set Time with hands moving clockwise with the time setting wheel ‘C’ until the correct time is reached. 1) Westminster chime 4/4 melody quarterly played and striking the full hour. 2) Westminster chime 4/4 melody quarterly played and striking the full hour with night silence. 3) Bim Bam melody half an hour played and counting the hour. 4) Bim Bam melody half an hour played and counting the hour with night silence. Right after selecting the melody (WM or BB) the clock starts chiming at the next full hour. The selected melody as well as one time the hour strike is played at that first full hour. The clock movement synchronizes itself for the first time when it passes the 1 o’clock position. Afterwards the hour strike will be according to the correct time of day. When switching the melody from Westminster to Bim Bam or conversely the requested melody occurs at the next full hour. **The correct hour count will start after the clock passes 1:00 for the first time. Additionally there is a night reduction function during which the melody is played at a reduced volume. While the night reduction is activated the melody occurs at a reduced volume from 22: 15 o’clock to 6:45 o’clock. In order to activate the night reduction set the melody switch to the WM or BB “moon” position. If the night reduction sets in during the day instead of during the night, please put the time forward by 12 hours. If no night reduction is requested, set the melody switch to the WM or BB “sun” position. Three volume levels are available (full volume, reduced volume and off). Please select by putting the knob to the corresponding position. If you move the time setting wheel clockwise, the hands on the clock will also move clockwise.